Before anything, we hear the music. Intricate and uplifting, the atmospheric and playful tones of Isaac Thomas Kottukapally’s soundtrack sets the sonic stage, bringing the audience into the world of Encounter. It is a world of many parts made from the beautiful, the bright, and the creative. But just as suddenly as the magic of this music begins to settle, it is interrupted by the sound of gunfire. This is the other side of Encounter, the searing, the unflinching, and the intense. A production of India’s Navarasa Dance Theater, Encounter creates a perfect balance of these components in a story of Indigenous resistance. Combining classical Indian dance, aerial dance, Bollywood, and martial arts, Encounter tells the story of Dopdi Mejhen, an Indigenous woman whose forest community is under siege by military forces. Though the story they tell is complex, the expertly measured balance of movement, song, and dialogue allows it to flow as fluidly as the performers move. The script is at times clunky in its colloquialisms and a touch heavy-handed, but is used so sparsely so as to be a minimal interruption. 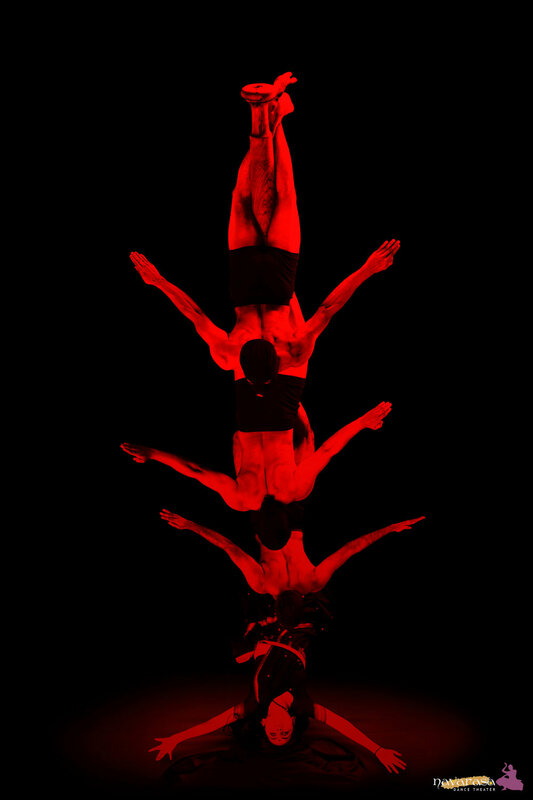 It is no wonder they have gained their reputation as the best physical theatre out of India—the clarity of the physical storytelling from this accomplished company is absolutely expert. And though the show’s musical design was significant, even better was the music the company made themselves, intoxicating both at its most celebratory and most furious. Dr. Aparna Sindhoor—Navarasa’s founder—gives a charming and arresting performance as Dopdi, with an economy of movement that can only come with twenty-plus years of practice in her craft. The range of moods displayed by the whole company—from tenderness to fury—are exhibited in her performance, grounding the work in Dopdi’s character without overshadowing the rest of the cast’s considerable talent. As Sindhoor and Anil Natyaveda explain in the Director’s Note, their Indian context of the word encounter “is a euphemism for the state orchestrated ‘chance meeting’ to get rid of the so-called enemies of the state.” Telling the story of one such encounter, Navarasa at once explores this horror while providing a counter narrative that highlights the power within targeted communities. As the opening production of Diwali in BC—a new festival from Diwali Fest Artistic Producer Rohit Chokhani, Encounter strongly represents Chokhani’s curatorial focus on feminine power. But the work was also selected with an awareness of the land on which the festival takes place. As Encounter attempts to honour the history of Indigenous peoples internationally, this staging represents Chokhani’s effort to bring South Asian culture into conversation with the First Nations of BC, in Vancouver and beyond. On land with no shortage of historical and contemporary State violence towards Indigenous communities and individuals, the contemporary tone of Encounter suggests just how much conversation there is to have. Encounter runs at The Cultch from October 17 to 22. Tickets can be found here.